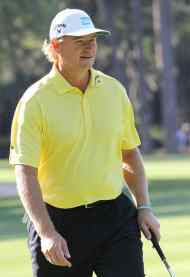 Ernie Els needs no introduction to golf fans. With 65 career wins including four major championships, he has been among the World’s best for around twenty years. His first major came in the U.S. Open at Oakmont in 1994, winning again at Congressional in 1997. His first British Open was at Muirfield back in 2002 and he collected the Claret Jug for a second time in 2012 following the dramatic collapse of Adam Scott over the closing holes at Royal Lytham & St Annes. During his glittering career, Els topped the European Tour Order of Merit in 2003 and 2004 and won the World Match Play Championship a record seven times. He is a former Number One in the Official World Golf Ranking and held his position in the top ten for a record 788 weeks. He was elected to the World Golf Hall of Fame in 2010 and rose to 15th in the rankings after his Open victory in 2012. He is also widely respected for his charitable foundation supporting underprivileged youngsters in his home country. Els turned professional shortly after winning the South African Amateur Stroke Play Championship in 1989. Two years later he won his first professional tournament on the Southern Africa Tour and topped the Order of Merit in the 1991/92 and 1994/95 seasons. In 1994 Els won his first major championship at the US Open after defeating Colin Montgomerie and Loren Roberts in an 18-hole playoff. Els began the playoff by dropping four shots in two holes but battled back to level with Roberts and win the second hole of sudden death. Els gained his second major at the US Open in 1997, again defeating Colin Montgomerie. In 2000, Els was given honorary life membership of the European Tour because of his two U.S. Opens and three World Match Play titles. He came close to adding a third major that season, finishing runner-up in the Masters, the US Open and The Open Championship. He also finished second in a further seven tournaments worldwide. 2002 began well for Els with victory at the Heineken Classic at the Royal Melbourne Golf Club. He then won the Genuity Championship title and won his first British Open Championship at Muirfield. On this occasion, Els came through a four-man playoff, putting to bed any doubts about his mental strength after so many near misses in recent years. Els won his first European Tour Order of Merit in 2003 after four victories and three runner-up finishes. He also achieved consecutive victories in America with the Mercedes Championship and Sony Open and was in the top 20 in all four majors. Els won 6 times in 2004 including the Memorial, WGC-American Express Championship and a record sixth World Match Play Championship. Els was also inspired in the majors, being beaten by Mickelson in the Masters, finishing ninth in the US Open and losing the British Open in a playoff against Todd Hamilton. He closed out his season with a fourth place finish in the US PGA. The 2005 season was curtailed due to a knee injury, although Els still captured the Dunhill Championship. It is a measure of his consistency that, when he finally missed the cut in the 2007 Masters, he had set records on both the European and PGA Tours. He made 46 consecutive cuts in the states and 82 events in Europe without exception. In 2008, Els won the Honda Classic at PGA National's Championship Course in Palm Beach Gardens, ending a three and a half-year drought on the PGA Tour. Another relatively unsuccessful period followed and Els switched coaches from David Leadbetter to Butch Harmon in an effort to revitalise his game. He long awaited victory did not come until the WGC-CA Championship at Doral in 2010. He also finished tied for third at the 2010 US Open at Pebble Beach. In October the same year, he won the PGA Grand Slam of Golf when defeating David Toms by a single stroke. In December, Els won the South African Open, again by one shot, this time from compatriot Retief Goosen. In 2011, Els slid out of the top 50 of the Official World Golf Rankings for the first time since 1993. He hinted at a return to form when finishing second in the Volvo Golf Champions but failed to qualify for the Masters after narrowly failing to make the playoff at the Transitions Championship. If anyone thought that Els was in decline, they were forced to think again when he won his second Open Championship in 2012. He almost accepted the Claret Jug with a hint of embarrassment after watching Adam Scott self-destruct over the closing holes and flitter away a four-stroke advantage.